“We told them they don’t know what they are saying because God made everything good. You can’t kill innocent people and say God is Great. “You either don’t know what you are saying or you don’t believe it. We are trying our best not only in physically in dealing with the combatants but in trying to rehabilitate those left behind in the internally displaced persons camps and we have a commissioner there who is supposed to look after them. The President disclosed to the group that his administration has taken action on the illegal mining taking place in Zamfara State which is being linked to the banditry in the state. On health of workers and occupational hazards in oil and gas industry, Buhari said “There are standards, there are rules. I used to be in the petroleum sector for three and a quarter years under Gen. Obasanjo, there are rules. “You can’t take Nigerians on paper, it’s when it comes to practical application of what is on paper, this is where you have problem with Nigerians. “But when you look round, there are rules, there are committees and it depends on the leadership of a particular institution or place. If the leadership has the time and commitment to do his job, then there are rules and regulations by which he can go and efficiently run that organization or institutions. “But a lot of Nigerians, they will commit to memory all the paperwork, and then they will proceed to do what they like personally. So I assure you that the health of workers is clearly defined in each of the institutions especially the dangerous ones like oil rig operators and so on. 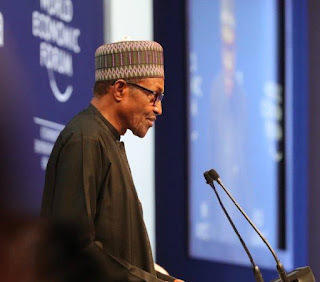 On treasury looter, Buhari said “I ‘bark but I cannot bite, Baba go slow,’ I have once ruled this country, some of you know that once upon a time I came in uniform and what I did was to arrest from the president downward. The president, Vice President, the governor’s and ministers, other than the president and the Vice President, the others, I put them in Kiri-Kiri, and I told them they are guilty until they can prove themselves innocent. “And you know subsequently what happened- we put about six tribunals base on the geopolitical zones, and those who were ministers and governors were asked to justify what they have in the banks and physical on the ground relative to their legitimate earnings. There were only two Nigerians then to my knowledge who were found to be very Honourable, both of them are dead now: Biliaminu Usman, a junior minister, from Jigawa State, and Adamu Chiroma, a minister of finance and governor of central bank. “Eventually I was released, and that was why I made up my mine since the bulk is partisan politics, I joined the partisan politics. You also know what happened, I tried three times, and I managed to succeed the fourth time. “And the three times I tried, 2003; 2007, and 2011, I ended up in Supreme Court. All the time, I was claiming that I was actually the person who won the election but I was rigged. “But because I was in the opposition, I never won any of the cases until God brought technology- Permanent Voter Card (PVC) and so on. The President said that his administration is investing more on research and development. He said the Government is coming up with a policy to take the full advantage of the resources of the country to get first class equipment in Nigeria institutions and to train and retrain teachers. On diversification, he said “What we did is to try to encourage agriculture. Fertiliser made available at the half price it used to be. We encouraged people to go back to land. The response was excellent. “We have virtually achieved food security, we have stopped the importation of rice. The money we have saved in foreign exchange in hundreds of millions of dollars, not even in naira. We are putting that into the infrastructure. “As you know the roads, some of them were not rehabilitated since what used to be the PTF. From Abuja to Onitsha, from Abuja to Port Harcourt, back and other roads. Equipment in hospitals and other institutions. I was forced to go to public so many times. What Nigeria was earning between 1999 and 2014 from crude. Production was 2.1m barrel per day, the barrel of Nigerian crude was $100 per barrel, it went up to $143. “So, Nigeria was earning 2.1m times $100, times 16years. But look at the condition of our infrastructure when we came; the roads, the rail was killed and you know there was no power. “I think one of the leaders of those administrations made a slip tongue by saying that they spent $16bn, not naira on power. But, where is the power and where is the $16bn. Maybe eventually by the end of this term will get at it.